Delphi Technologies explains how it has made the selling and maintenance of its products as straightforward as possible, and how this will help factors to grow their business and develop lasting relationships with their customers. The health of vehicle’s steering and suspension system determines its chassis dynamics, and is vital to how it performs. Although it may often go unnoticed, general wear and tear, and the fitting of non-OE parts as original components are replaced, can have a negative impact on the way a car drives. More importantly, it can affect durability and lead to reduced maintenance gaps, increased time off the road and rising costs of keeping older cars roadworthy. Manufacturers invest millions into developing steering and suspension systems, carefully honing the setup to ensure that they’re more than the sum of their parts. Because of this, there are significant benefits to selling components that you know have been developed specifically to fit – and work – together. For Delphi Technologies, creating high- quality parts starts with meticulous testing and product validation processes, something lower-quality alternatives might not offer. The OE equivalent is analysed and reviewed, before 3D scanning and modelling systems collect data to the smallest details possible, and Delphi’s reengineering process can begin. When testing a wishbone, Delphi Technologies tests all three axes at the same time to replicate side-to-side movement, forward force from acceleration and deceleration, and up-down movement. This appreciation of a car’s chassis dynamics, says Goulding, has also led Delphi Technologies to expand its aftermarket steering portfolio to offer a full- service solution. Steering components from Delphi Technologies contain all of the fitting accessories required by technicians. This ensures that there is no confusion over what may or may not be needed for each maintenance job, and reduces the chance of technicians walking away with incorrect parts. 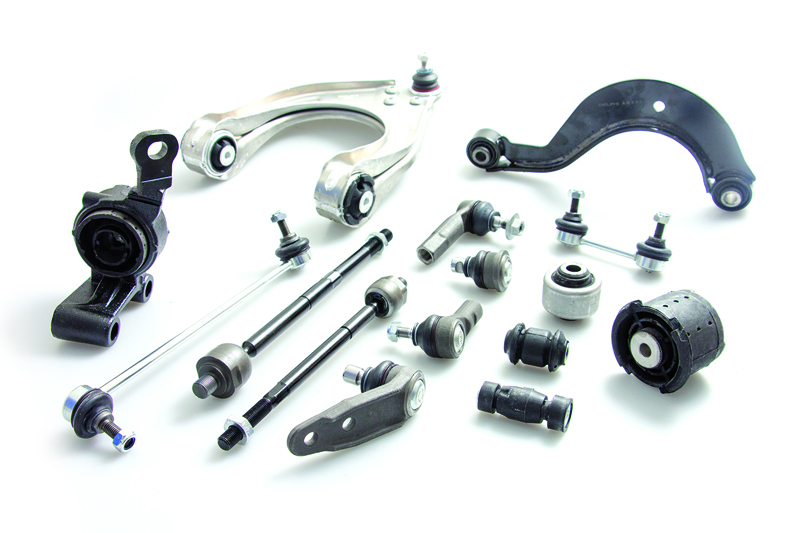 The company has introduced over 500 new steering parts to the aftermarket; spanning control arms, ball joints, link stabilisers and rod assemblies for Europe’s most popular models. Each aftermarket component is said to be manufactured to OE standards of performance and durability, and undergoes rigorous testing that covers material and dimensions checks, crack detection and fatigue analysis, and comes with a three-year, 36,000-mile warranty. “The full-service solution is about more than just providing OE quality parts to the aftermarket, it’s about helping our customers to grow their businesses and help promote best practice,” concludes Goulding. “We want to help factors to not only understand how to install a part, but to increase awareness of any known difficulties and to provide the right accessories that are required to complete each job. Being able to provide technical insight will help factors to grow their business and develop lasting – and trusted – relationships with end users. So, as the aftermarket continues to proliferate, any additional support and simplification of these tasks is more than welcome.” concludes Goulding. For more information about the full range of components available from Delphi, click here.